Looking for an adventure the whole family can enjoy? Then off-roading in a new Jeep Rubicon might be the perfect choice for you. 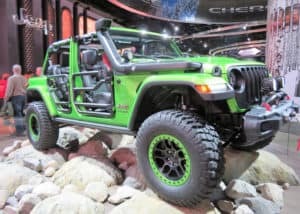 Completely redesigned for the 2018 model year, it’s the best off-roading trim in the Wrangler lineup. The Rubicon comes with all the same standard and available features as the Sahara trim, only better. Take off-roading to the limits with the Rubicon at these four parks near Indianapolis, Indiana. Load up your new Rubicon and head west on I-74 for 83 miles to the Badland’s Off-Road Park in Attica. More than a series of trails, this park is 800 acres of diverse terrain and features a dedicated rock quarry and SUV park. Enjoy full-service amenities from lodging, food, and gear. Conquer the park’s sand dunes, wooded trails, gravel, mud, and rocks with your Jeep’s Rock-Trac 4×4 system that gives you more control and more torque. Want ultimate traction? Put the Tru-Lok electronic remote locking differentials to the test. Both come standard on the new Rubicon. Calling all Jeep junkies to the Redbird State Recreation Area in Linton, 90 miles south on I-70! Named after the Redbird Coal Mine, the park offers wheelers both treasures and challenges with its miles of off-road trails. Your Rubicon was made to crawl — rock crawl that is, and what better place than 1,400 acres of former coal mine territory? From gentle slopes to thrilling, technically tricky climbs, your 2018 Rubicon’s 3.5 liter V-6 delivers 285 horsepower and 260 pound-feet of torque to all four wheels. In the mood to tackle 16,000 acres of rugged hillsides, rocky ridges, and fog-shrouded ravines? Then take I-65 south 60 miles to Brown County State Park. Glacier meltwaters gouged their way through the area, creating narrow ridges, steep slopes, and deep gullies, perfect for your trail-rated Rubicon’s new 33-inch all-terrain performance tires. Brown Park is a hotspot for fall colors. Park your new Rubicon on a scenic vista and watch a sunrise or sunset over the trees. Get cozy and activate your Jeep Rubicon’s automatic climate control or dial in your favorite song with the stock HD satellite radio and Alpine audio system. Whether you’re a seasoned pro or you’re just looking for some outdoor fun, visit Interlake State Recreation Area, 158 miles south via I-69. Discover 3,550 acres of recreational opportunities with nearly 100 miles of country trails. There are three areas of former mining landscape that create a variety of experiences for every Jeep enthusiast. From rolling grasslands to steep spoil banks and strip pits, Interlake offers up a diverse array of scenic views. Never lose your way in the park with your Rubicon’s upgraded Uconnect system with Apple CarPlay and Android Auto in an 8.4-inch touchscreen with navigation built right in. Whether you’re wandering the woods or traversing a challenging ravine, upgrade your rig to the 2018 Wrangler Rubicon, starting at $33,645. Test drive your next Jeep at a local showroom today.